Notes: I've been reading War and Peace for a couple of weeks now, though I haven't gotten very far because of my recent surgery and just the denseness and sometimes heaviness of the novel. I've got a feeling War and Peace is going to be one of those rare books that I'm going to have to read in spurts over the next year instead of in one big gulp, which is usually how I read. To that end, I wanted something a little easier to read for a while, but something that felt like it had some substance to it. Walking through the library this morning, I stumbled upon "Reading Jesus." Mary Gordon, the author, is a novelist and was raised Catholic. She got to wondering a while back why so many people seemed to have different ideas about Jesus, and then it dawned on her she had never read the Gospels. She proceeded to do so. This book is her reflections on the Gospels, to some extent, but is really a semi-secular literary study of Jesus as a literary character (though not, to not be misunderstood, as a fictional character). This idea sounded interesting to me, a novelist studying Christ as a literary figure. I flipped through the book, it's short, seems easy to read. I decided it was just the thing. Mini review: Reflecting upon the Gospels from an author's point of view is an interesting one, but Gordon cannot do so without her own Catholic/Christian background getting in the way to some extent. But she freely admits this. While looking at Jesus as a character, she finds much to like about him but also some things not to like. For example, in the book of John, anti-Semitism is quite strong, at one poing Jesus declaring Jews have become the children of the devil. However, Gordon does come around to believing there is a moment of transition and possibly transformation in the final words of Christ. Seemingly, not only does he redeem all of mankind with his death, but in Gordon's eyes he also redeems himself to a large extent, mainly because Gordon finds strength in her own beliefs in Jesus' final words. I'm oversimplifying here for brevity, but that's the basics to a certain extent. It was quite interesting to read this book so soon after finishing John Gardner's On Moral Fiction because Gordon seems to come to some of the same conclusions as Gardner, chiefly that, for a writer, there might not be true answers to be found but it is the asking of questions that is key. After getting out of the hospital, I've had a lot of pain in my left arm, shoulder and chest, so it's not been easy to write. Also, I lost at least a week of writing just because of my surgery. I'm slowly trying to get back in the groove, but it's not easy so far. The novella I've been working on, "Bayne's Climb," is on the backburner just for a couple of weeks. Why? Well, I don't want to go into detail yet until things are nearer fruition, but I've got a publishing contract on one of my fantasy novels. And the publisher has suggested I work up a couple of short stories set in the world of Kron Darkbow and characters, basically to us as promotional material when it's time for my novel to be published. So, for at least the next couple of weeks, I'm back in the world of Kron Darkbow. It's actually been kind of fun, especially since I've not been there in quite a while. Once I'm finished with those stories, I'll get back to "Bayne's Climb." I'm back from the hospital. I'm alive. I'm in a fair amount of pain. It even hurts to type this. So, probably not a lot of writing in my immediate future. And I've come to realize "War and Peace" was the wrong choice of reading material while recovering from heart surgery. Not because of the subject matter, but because of the size of the book. Yikes! It even hurts to read! I'll be okay, though. I'm already feeling better than I did the day before, and the pain pills help. I'm headed to the hospital tomorrow for minor surgery, to have a miniature defibrilator implanted in my chest. I'm not expecting anything overly bad to happen, but I'll probably be offline for at least a few days. Maybe not. We'll see. I do know my left arm is going to be in a sling for at least a week, so I don't know if I'll be able to do much typing and/or writing. Again, we'll see. See you on the other side. One way or another. Notes: Okay, it's taken me 40 years to work up the courage to read this monster, classic novel. It's considered one of the longest novels ever written, and it concerns the French invasion of Russia during the early 19th Century. I'm reading this now for a couple of reasons. One, it's the centennial of Tolstoy's death, and this serves as a reminder to me I need to get around to reading this novel. Two, I'm going into the hospital next week, so my reading and blog posting will likely be stunted for at least a few days, maybe as long as a week. This long work leaves me without having to blog much in the upcoming weeks, at least not about what I'm reading, and it will give me something to focus on, something in which I can take my time without having a need to get finished. In other words, I can take my time with this one. And at more than a thousand pages, I probably will take my time. There are multiples editions of War and Peace around, some quite different from others, and this one is the 1906 English translation. Mini review: It took me so long to read this one, I was beginning to doubt I'd finish it this year, but I did. War and Peace is not the easiest of reads, especially for the modern reader, mainly because there's not a lot of action and even when there is action it's written almost more as a school history book than a novel. Also, there are so many characters and they have Russian or French names (most of which were unfamiliar to my American ear), it probably took me the first 400 pages before I could really begin to tell the characters apart from one another. But, all that being said, I loved this novel. I will probably never read it again due to it's length and the amount of time it took me to read it, but I still love it. War and Peace is a sweeping tale of Napoleon's invasion of Russia in the early 19th century and his eventual withdrawal. There are multiple stories in this gigantic novel, several of them at first not tied directly to the central action of the novel, the French invasion of Russia. The stories and and characters don't really all come together in one great big climax, but rather the effect of the French invasion is shown upon each of the characters, how there lives change due to the war. And for the most part, this isn't really a war novel. Yes, the war in the central point and a few of the characters are officers, but much of the story is of civilians fleeing from the French and how their lives are after the worst of the war. This is also a philosophical and spiritual tale, but not one that hits you over the head, at least not until the last 30 or so pages when Tolstoy writes a non-fiction article concerning free will. I'm glad I read this novel, though I likely won't ever again, but it definitely deserves its place among the world's greatest literatures. John Gardner quotes from "On Moral Fiction"
I recently finished John Gardner's On Moral Fiction and found so many great quotes within, not all of which I agree with but still found interesting, I just had to share. They are below. "Every hero's proper function is to provide a noble image for men to be inspired and guided by in their own actions." "The gods set ideals, heroes enact them, and artists ... preserve the image as a guide for men." "Real art creates myths a society can live instead of die by, and clearly our society is in need of such myths." "Fantasy writing, of course, nearly always comments on the time and place that produced it ..."
"By its nature, criticism makes art sound more intellectual than it is ..."
"Art builds temporary walls against life's leveling force ... In corpses, entropy has won." "... what we generally get in our books and films is bad instruction: escapist models or else moral evasiveness, or, worse, cynical attacks on traditional values such as honesty, love of country, marital fidelity, work, and moral courage. This is not to imply that such values are absolutes, too holy to attack. But it is dangerous to raise a generation that smiles at such values, or has never heard of them, or dismisses them with indignation, as if they were not relative goods but were absolute evils. The Jeffersonian assumption that truth will emerge where people are free to attack the false becomes empty theory if falsehood is suffered and obliged like an unwelcome -- or worse, an invited -- guest." "We are beset, to an extent few people were before us, by doubts on every side; and the doubts are increased, if not partly introduced, by the moral relativism which naturally arises in a world of rapid communications and the sort of cultural interchange both invaluable and inescapable in the American melting pot." "The traditional view is that true art is moral: it seeks to improve life, not debase it. It seeks to hold off, at least for a while, the twilight of the gods and us. I do not deny that art, like criticism, may legitimately celebrate the trifling. It may joke, or mock, or while away the time. But trivial art has no meaning or value except in the shadow of more serious art." "For the most part our artists do not struggle -- as artists have traditionally struggled -- toward a vision of how things ought to be or what has gone wrong; they do not provide us with the flicker of lightning that shows us where we are. Either they pointlessly waste our time, saying and doing nothing, or they celebrate ugliness and futility, scoffing at good." "We recognize true art by its careful, thoroughly honest search for and analysis of values. It is not didactic because, instead of teaching by authority and force, it explores, open-mindedly, to learn what it should teach." "To worship the unique, the unaccountable and the freaky is -- if we're consistent -- to give up the right to say to our children, 'Be good.' "
"... morality has become, in many people's minds, an unattractive word ... . ... but the only thing wrong with morality ... is that it's frequently been used as a means of oppression ..."
"Tolstoy argues, in effect, ... that the ideal held up in a proper work of art comes from God ..."
"With the worship of Zeus substituted for Christianity, this is almost exactly Homer's position ... What the warrior-hero does on the battlefield, especially if he is half god, like Achilles, shows ordinary men what the gods love." "Dante ... had ... come to the same discovery Aquinas had reached: that logical argument can support opposite and mutually exclusive conclusions with equal force, so that reason is at best ... a limited guide." "In the name of democracy, justice, and compassion, we abandon our right to believe, to debate and to hunt down truth." "The true critic knows that badness in art has to do not with the artist's interest or lack of interest in 'truth' but with his lack of truthfulness, the degree to which, for him, working at art is a morally indifferent act." "... the interaction of characters is everying." "Our more fashionable writers feel, as Chekhov and Tolstoy did not, that their art is unimporant; and they're correct." "Religion's chief value is its conservatism: it keeps us in touch with what at least one section of humanity has believed for centuries. Art's chief value is that it takes nothing for granted." "We need to stop excusing mediocre and downright pernicious art, stop "taking it for what it's worth" as we take our fast foods, our overpriced cars that are no good, the overpriced houses we spend all our lives fixing, our television programs, our schools thrown up like barricades in the way of young minds, our brainless fat religions, our poisonous air, our incredible cult of sports, and our ritual of fornicating with all pretty or even horse-faced strangers. We would not put up with a debauched king, but in a democracy all of us are kings, and we praise debauchery as pluralism." "It is a fact of life that noble ideas, noble examples of human behavior, can drop out of fashion though they remain as real and applicable as ever -- can simply come to be forgotten, plowed under by 'progress.' "
"I would not claim that even the worst bad art should be outlawed, since morality by compulsion is a fool's morality and since, moreover, I agree with Tolstoy that the highest purpose of art is to make people good by choice. But I do think bad art should be revealed for what it is whenever it dares tostick its head up ..."
"It goes without saying, though I will say it anyway, that even the mostly lofty and respectable theories of human motivation -- from psychiatrists, biologists, theologians, and philosophers -- must always be treated by the serious writer as suspect." "... the true artist is after 'glory,' as Faulkner said -- that is, the pleasure of noble achievement and good people's praise. The false artist is after power and the yawping flattery of his carnivore pack." "Perfectly comfortable art is dead art, the product of an embalmed mind that has nothing to say to anyone, even the aesthetically dead." "It can be shown by infallible or at least official logic that values are all a matter of opinion, that what seems good in one culture ... seems unpleasant to another. It can be proved positively that everything is relative. But not to an artist." "... what ... artists care about -- what they rave or mourn or bitterly joke about -- is the forms of truth: justice, fairness, accuracy." "... to write badly because otherwise one might not get published is useless compromise." It probably won't last, but right now as I type this my e-book "An Amateur Beer Snob's Guide to Beer" is the No. 1 selling e-book about beer at Amazon. Yes, I'm even beating out famous beer snob Michael Jackson (no, not THAT Michael Jackson). Notes: I don't currently feel a need to read any of those how-to-be-a-writer books, but this isn't exactly that. It seems to be more of the author's opinions on criticism and the state of literature during the late 1970s. Yes, this book is slightly more than 30 years old, thus it won't be very up-to-date concerning literature, but it still sounded interesting enough to get into. Also, the late John Gardner is one of the better-known novelists from the mid-20th century and he delved mainly into literary fiction, so I want to see what he had to say. I've not read much by him, but what I did read was spectacular, especially the novel "Grendel," the Beowulf saga tol from the monster Grendel's viewpoint. Mini review: Though strong on opinion, this was an excellent book for those interested in persuing a literary career. Genre writers might find all this a bit over their heads, or sometimes even rude, but in places Gardner actually has quite positive things to say about the potential of fantasy, science fiction, etc. He especially seemed to appreciate Asimov and Peter Beagle. Admittedly, some of this was over my head, but much of it was not and I found I appreciated it. 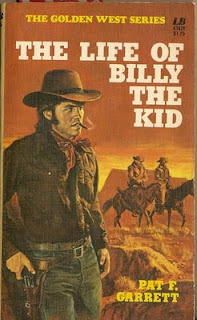 Notes: Originally titled "The Authentic Life of Billy the Kid, the Noted Desperado of the Southwest" when it was published in 1882, just a year after the Kid's slaying by the gun of the author (at least according to general history ... there've been rumors the Kid escaped or that Garrett let him go), I didn't want to let this one pass me by when I ran across it in a used book store recently. I've read plenty of history about the Kid, Garrett and the Lincoln County War, but I think it'll be interesting to read this non-fiction book by the man who supposedly killed Billy the Kid. Mini review: A short little read. Also easy to read and, despite some of the Old West slang, sounded pretty modern. 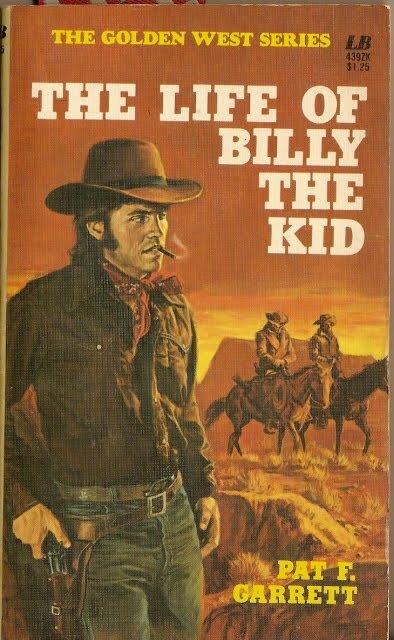 It was interesting to read the story of Billy the Kid from someone who knew him personally, and who happened to be his killer. I won't hazard a guess as to whether all the facts are true as portrayed, but the gist of the tale seemed to match up with other histories of the time. Worth reading, especially if you're an Old West junkie.